Being aware of the way we distribute the weight on our feet is very important in all the standing postures and also teach us how to do it when we change and we are on our shoulders, forearms, head and hands. How can you see where you normally put the weight when you are standing? As Guruji says in “Light on Yoga”, notice where the soles and heels of your shoes wear out. Another way is to observe your footprint on the sand, this will show you the parts of your foot that are in contact with the floor and the parts that are not. With this new awareness try Tadasana: Re-distribute the weight of your body on your feet in a way that you can now bring balance to the feet structure and form. Notice if there is any change in the sensation of your own body and mind. “The way we stand affect our spines and this, affects our mind. 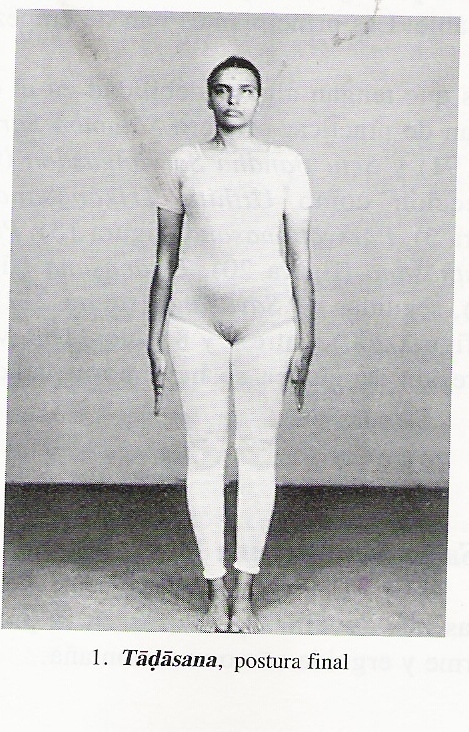 Tadasana is very usefull to awake our bodies, our minds and brains.” Geeta Iyengar. Previous Previous post: Garudasana: Some technical info. Next Next post: Mountains and me.